Sometimes an eclipse is just an eclipse. Friday’s ‘Blood Moon Lunar Eclipse‘ did not destroy the world as predicted. These days someone needs to keep track of the soothsayers! We’ll talk about it in World Survives Eclipse-Western Wisconsin Road Trip-Podcast 742. Friday also marked the release of first quarter Gross Domestic Product numbers. To hear the president tell it, 4.1 percent economic growth is historic. Hear my take on the first blush of reporting on the good economic news in World Survives Eclipse-Western Wisconsin Road Trip-Podcast 742. On a desolate lake road in Western Wisconsin at midnight, in the full moonlight, one wonders whether any of that matters anyway! What’s more the silence here in the middle of nowhere is incredible. I took a short road trip to what we like to call “God’s Country” to talk about organic farming. I’ll take that up in the next podcast. Every now and then I have to do walk and talk podcasts. No rules. No Prep. I call these ‘consolidation podcasts’. Because things seem to happen so frequently, following the news can be a head spinner. I do these walk and talk podcasts, usually at midnight, to try to make sense of it all. News Flash! World Doesn’t End! Furthermore last week the boomers were predicting the end of the world after the big eclipse. On top of that we are whipsawed by reactive coverage of the news. Getting subscribers and listeners to the Bob Davis Podcasts on track at the beginning of the week is one of my missions. Most noteworthy for this podcast is the release of the new economic data. 4.1 percent GDP growth in a single quarter is not unprecedented or even historic. It is good news. The key here is what caused the growth? Moreover is the growth sustainable? In conclusion this week you may hear a lot of chatter about the economic numbers. Due to partisanship equal amount of chatter passing for ‘analysis’ will be negative and positive. Above all listeners wonder what to look for to find information without partisanship. Sometimes you find a little bit of truth on a quiet country road in the mist and moonlight! After three years at the motorcycle rally at Sturgis, South Dakota it gets harder to find the story. Lots of engine revving and people partying. Been there. Done That. This time I found a slightly more reserved part of the Sturgis Rally, in Sturgis 2017 Shows How We Go With The Flow-Podcast 654. I get a lot of requests for travel advice. Been all over and through the USA more than once in Mobile Podcast Command. Up and down both coasts. One thing I’ve learned. Planning is good. Throwing the plan out the window is better. As in life though, it is easier said than done. In Sturgis 2017 Shows How We Go With The Flow-Podcast 654. We’ve all heard the stories about the job someone took on a lark and it worked out great. Or the unexpected and unplanned move. The mail order bride who turned out to be ‘the one’. Floating down the river instead of swimming against the current. This has always been a difficult concept for me. It’s the core of Sturgis 2017 Shows How We Go With The Flow-Podcast 654. I believe in goal setting. Objectives. Working toward those objectives. I believe if you want to enjoy travel, each trip has to have a purpose. An objective. I set goals and objectives for travel, and life. In many ways they are similar concepts. We ‘travel’ through life. It seems to me that if we just float along anything may happen. Achieving something means deciding what you want and working toward that goal. Right? Often, travel has no respect for goals and objectives the traveler holds dear. Life is very much like travel in this respect. On this trip, once again I learn frustration with myself, with goals. THE PLAN evaporates when I just go with it. That is a good thing. In Sturgis 2017 Shows How We Go With The Flow-Podcast 654. Especially relevant were my visions of a fantastic campground at Sturgis, surrounded by the party. That would have been possible with more planning and a lot more money, come to think of it. Thinking about coming out to South Dakota for Sturgis 2018? Start saving now. 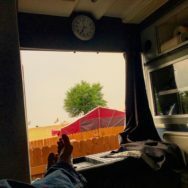 Motorcycling these days means putting your bikes in the back of an RV,or trailer, trucking them to Sturgis, or Keystone, or the Badlands National Park, and cycling to the Rally from your campsite. In Sturgis 2017 Shows How We Go With The Flow-Podcast 654. You can also spend close to a thousand dollars for a campsite at the rally for a week, with your RV and trailer. It seems a far cry from the bad old days in the 1960’s and 1970’s. Then again, everyone is having a great time. Sturgis is still a place where people passionate about motorcycles can spend as much time as they want riding, and talking about their motorcycles. Getting work done. Buying accessories or even a new bike. Sturgis is still about freedom and passion. The riders are often a little older, wiser, and better off financially. Isn’t that what America is all about? We’ll talk about it in Sturgis 2017 Shows How We Go With The Flow-Podcast 654. Every now and then you run across a perfect stretch of road. Didn’t start out as a perfect road trip, but it’s been close. 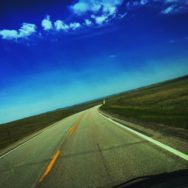 In Sturgis 2017 Road Trip-Interstate Free-Podcast 653 talk of interstate free road tripping. Especially relevant are two eclipses approaching. A lunar eclipse on August 7th, 2017 and then a total solar eclipse on August 21st. Is this the calm before the storm? Is Sturgis the ultimate party before the Walking Dead Scenario? Over the last few road trips I have been concentrating on staying off the Interstate. What are the pro’s and con’s? People have asked me for travel advice recently. At the present moment I can think of two things. Have a goal. Stay off the Interstate. In Sturgis 2017 Road Trip-Interstate Free-Podcast 653. While there was a little political content in the last podcast of the EAA’s Osh Kosh AirVenture show, some have wondered if I will ever fully reengage in the political sphere. Your answer is in Sturgis 2017 Road Trip-Interstate Free-Podcast 653. It’s kind of like staying off the Interstate, isn’t it? Better to enjoy these last few weeks of summer. The corn is high. Night driving reveals combines echeloned in huge dark fields in South Dakota, harvesting. Already. Blue Skies. Sunshine. 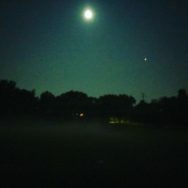 Cool night air. A few motorcycles dot the lanes miles ahead, and a few well behind. Happiness is a full tank of fuel and a clean windshield. In Sturgis 2017 Road Trip-Interstate Free-Podcast 653. Sponsored by Ryan Plumbing and Heating of Saint Paul.